But something even more amazing graced the Goodison pitch that day when young Kayley Keir stepped out at half time, just six months after receiving a life-saving double lung and heart transplant. Born in the same year that Dave Watson lifted the FA Cup for the Blues, Kayley is a lifelong Everton fan. So much so that when attending a glittering awards ceremony, she insisted on wearing her Everton kit to go up and collect the award she had won! But in 2003 Kayley was told that she would die if she did not have a double lung and heart transplant. Thankfully, donor organs were found and the operation was successfully carried out in September of last year. 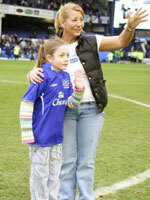 Kayley and her mum Jackie on the Goodison pitch. Kayley suffers from Cystic Fibrosis (CF), the <?xml:namespace prefix = st1 ns = "urn:schemas-microsoft-com:office:smarttags" />UK's most common life-threatening genetic disease. The disease affects various organs of the body but in particular the lungs. About 155 young people die each year in the UK from the disease and this is due to the chronic and increasing shortage of donor organs. To highlight this problem, and hopefully encourage more people to become organ donors, the ‘Live life, then give life' campaign has been set up by two CF sufferers. Emily Thackray (21) and Emma Harris (32) officially launched the campaign earlier this month after Emily was told that she would only have 12 months to live if she did not receive a heart and double lung transplant. Between them, Emily and Emma have lost 15 young friends to the illness and in launching the campaign they hope to encourage people to think and talk about the issue of organ donation and sign the National Organ Donor Register. The site also gives more information on Cystic Fibrosis and details the growing problem of finding organ donors. The ‘Live life then give life' site also contains a link to the National Organ Donor Register website where you can register to become an organ donor. 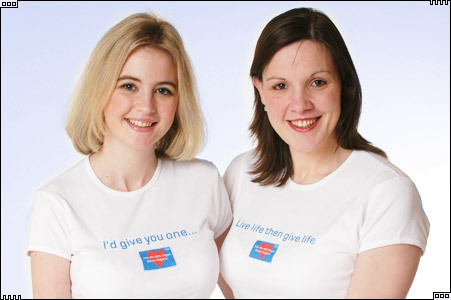 Emily Thackray and Emma Harris model the ‘Live life then give life' T-Shirts.